PSC National £100,000 Fundraising Appeal £1,100 from Wolverhampton so far. In June, after losing its pension fund investment case in the court of appeal, PSC launched a £100,000 fundraising campaign. After two months it has raised £86,000 bringing our target within sight. Wolverhampton PSC can be proud of its contribution towards this total, our garden party raised £500, Wolverhampton, Bilston & District Trades Union Council has given £100, City of Wolverhampton Branch UNISON donated £200, and we are aware of individual donations exceeding £300. Well done everybody and thanks for your generosity. Donations can still be made to Unity Trust Branch, Sort Code 60-83-01, Account number 20333702 or post a cheque to Palestine Solidarity Campaign, Box BM PSA, London, WC1N 3XX. It is vital the appeal reaches its target so PSC can stabilise its work after paying the legal costs and so it can consider taking its case to the Supreme Court. On 30 March 2018, in the worst single day of violence since the assault on Gaza in 2014, Israeli forces shot 773 unarmed Palestinians taking part in a Land Day demonstration. Thousands of Palestinians congregated in Gaza to start a series of protests called “The Great Return March”. Organised as a non-violent demonstration supported across Palestinian society, the protest is reaffirming the Palestinian right of return (grounded in International Law), and calling for an end to Israel's illegal decade long blockade of the coastal strip. Last week Israel deployed hundreds of snipers along the border of Gaza, who opened fire using live ammunition on unarmed Palestinian civilians. Over 1,400 Palestinians were injured, with 773 being shot, leaving 18 fatalities. There was not a single Israeli casualty. 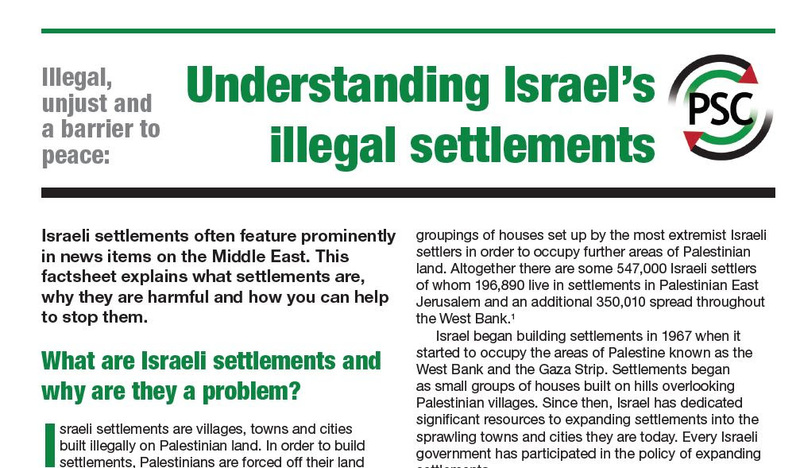 Campaign against Israel's illegal settlements. Israel builds these towns and cities on stolen Palestinian land – displacing Palestinians, taking away their livelihoods, and attempting to build Palestine out of existence. Our partners in Palestine have made it clear they want us to take action. So that's exactly what we’re going to do. 90-second video showcasing the #StolenHomes campaign, which is working around the world to get Airbnb to stop hawking rentals in illegal settlements. Airbnb has shown that we’re going to need to really work for this change. And our assessment is our next step is to ramp up the public conversation on their settlement profitteering. make sure this story gets out, watch - and share - it today. Airbnb is, in the end, just another corporation looking out for their bottom line. But they are sensitive to their public image and PR - and if we can get enough eyeballs on this video, we’ll be in a better position to drive them to the negotiating table. 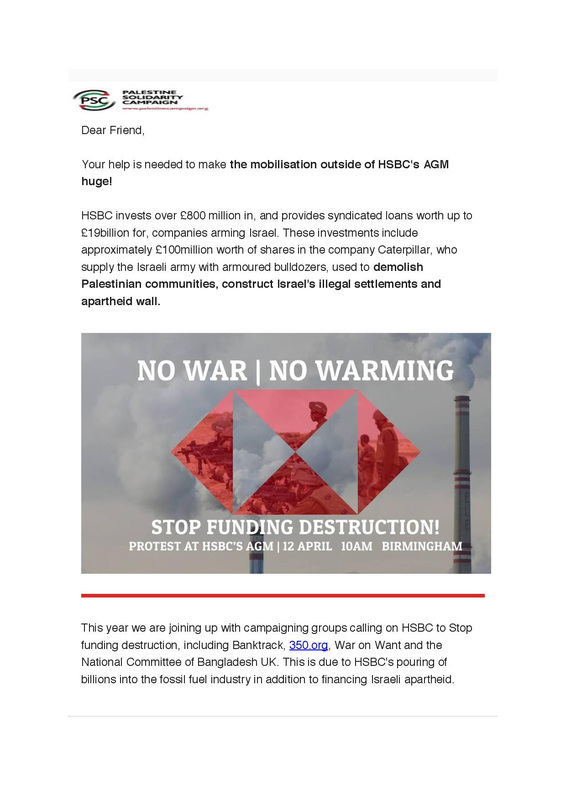 Saturday 28th April 2018 HSBC protest against links to arms sales to Israel Queens Sq Wolverhampton. Saturday 17 March 2018 10am-12noon protest outside HSBC, Queens Sq Wolverhampton-was in the snow but went well 10 took part handing out hundreds of leaflets outside HSBC bank which own large shareholdings in companies which supply arms to Israel, which end up killing Palestinian civilians. Now more than ever we need you to take that message with us to the streets. 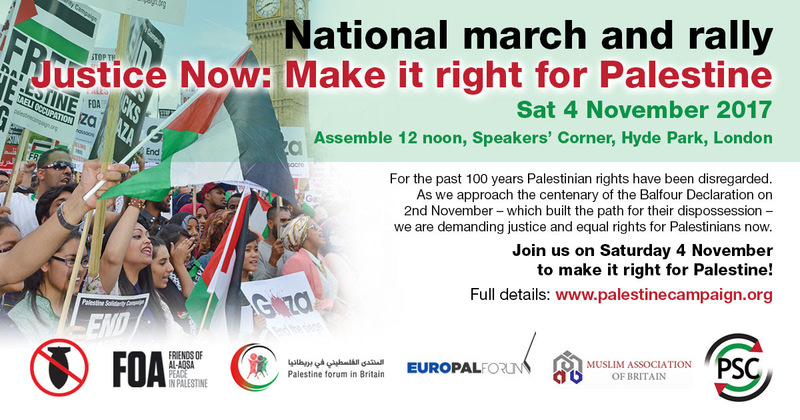 Get your friends and your colleagues and the groups to which you belong onto the streets of London on November 4th as we rally for Palestine. to the Palestinians, your cause is not forgotten and we in the UK in this year of the centenary of Balfour know our responsibilities; we will keep fighting, keep marching, and keep lobbying until you enjoy equality, justice, and rights in your homeland. To the UK government - acknowledge Britain’s historic complicity but recognise also your responsibilities now to put pressure on Israel to abide by international law and cease its violations of human rights.  HP is the second largest investor in Israeli Information Technology (IT). Its technology and equipment facilitate both the illegal Israeli occupation and apartheid, particularly through the development of its biometric system used for population and territorial control and surveillance of Palestinians both inside Israel and in the occupied Palestinian territory.  The Checkpoints. HP’s Basel system is installed at the Israeli military checkpoints in the occupied West Bank. These deprive Palestinians freedom of movement in violation of international law. When the Presbyterian Church wrote to the company about this, it replied saying that their system: ‘reduc(es) friction between Palestinians and Israeli soldiers at barrier checkpoints while expediting the passage process’.  The Israeli Military. HP provided the IT infrastructure for the Israeli Navy, thereby helping to enforce the blockade of Gaza, and supplies the computer systems for the Ministry of Defence.  The Settlements. HP employs settlers in Beithar Illit and provides services and technologies to two of the largest settlements in the occupied West Bank (Modi’in Illit and Ariel). Authority (PNA) insignia are assigned by Israel, which controls the Palestinian population registry.  HP Labs at Technion University. In 2012, the HP Labs based at TechnionUniversity (Haifa) was its largest center for research and development. Technion itself is considered highly complicit in the occupation, siege and attacks on Gaza as it is a base for research and development for a wide range of military equipment, with close links to Rafael Advanced Defence Systems and Elbit Systems. (working mainly on surveillance and attack drones). Over 1,500 Palestinians imprisoned by Israel have been participating in the hunger strike led by senior Fatah official Marwan Barghouthi since April 17 to protest the torture, ill treatment, and medical neglect of prisoners at the hands of Israeli authorities, as well as Israel’s widespread use of administrative detention -- internment without trial or charges. The hunger strike is largely being ignored by the western media. Write to the Foreign & Commonwealth Office, request it urgently raises the hunger strike with Israel, and ends its violations of international law and human rights conventions in the treatment of Palestinian prisoners. WHERE SHOULD THE BIRDS FLY 60 mins. Where Should The Birds Fly is the first film about Gaza made by Palestinians living the reality of Israel’s siege and blockade of this tiny enclave. It is the story of two young women, survivors of Israel’s Operation Cast Lead. Mona Samouni, now 12 years old and the filmmaker, Fida Qishta, now 27, represent the spirit and future of Palestinians. The film is a visual documentation of the Goldstone Report. But it is so much more. It reveals the strength and hope, the humanity and humor that flourishes among the people of Gaza. Few films document so powerfully and personally the impact of modern warfare and sanctions on a civilian population. FREE ADMISSION - collection for expenses. Marwan Darweish talks about his recent book, co-authored with Andrew Rigby, which examines the role of the unarmed civil resistance movement in the Palestinian liberation struggle. Marwan and his colleagues work informs a contemporary readership about this under-emphasized dimension of the Palestinian struggle, arguing that at the present juncture the popular resistance movement, especially in the West Bank, is the most significant form of struggle against the ongoing occupation. Popular Protest in Palestine also addresses the international dimensions of the Palestinian struggle, focusing in particular on the BDS (Boycott, Divestment, and Sanctions) campaign, the role of international solidarity activists in the Occupied Palestinian Territories and beyond, and the changing forms of engagement developed by international agencies seeking to work on the roots of the conflict whilst fulfilling their humanitarian aid mandates. @ 7.15pm Refreshments @ 7.30pm film: The Lab - an acclaimed film detailing the Israeli arms industry & its effect on the lives of Palestinians. 'The Lab', Directed by Yotam Feldman. Documentary. 60 minutes. 'The Lab' is a 2013 documentary film about the Israeli military industry, the international arms trade and the occupied Palestinian territories. The film is an award winning Israeli, Belgian, French co-production directed by filmmaker and journalist Yotam Feldman. It is 60 minutes long and was shot in Hebrew and has English subtitles. It shows how Israel makes profit by testing weapons in the occupied territories that are then sold worldwide with the marketing that they were tested in combat. The film reveals how the Israeli military occupation of Gaza and the West Bank is a marketable, highly profitable, national asset so valuable that the State of Israel cannot afford to lose. G4S have finally announced they'll be selling their subsidiary "G4S Israel" - their stake in the Israeli occupation. PSC, together with our partners and friends across the world, we've stood up to this mighty conglomerate and won! G4S are a massive company with huge profits. But by standing together and never giving up, even after years of campaigning - we've shown them that propping up occupation and profiting from apartheid is not an acceptable business model. Thank you! We are part of a Palestinian-led world wide movement that uses the simple, peaceful protest of boycott, divestment, and sanctions. We know that together we will end the Israeli Government's occupation and human rights abuses. So let's set our sights on the next big challenge... Hewlett Packard. Case against anti-drone protestors collapses - All charges against 19 anti-drone protestors have been dropped, after the Crown Prosecution Service admitted there was no realistic prospect of conviction. The 19 were arrested for protesting at UAV Engines Ltd, in Shenstone, Staffordshire, on 6 July 2015, one year after Israel's attacks on Gaza in 2014. UAV Engines Ltd is wholly owned by Elbit Systems, an Israeli company manufacturing military drones used to attack Gaza. “The Crown Prosecution Service has finally conceded they had no case. Taxpayers' money has been wasted on a police operation and prosecution, all based on a bogus injunction. “It would have been a scandal for people to have been made criminals for protesting the manufacture of weapons used in war crimes. This is a victory for the right to protest. On 1 July, UAV Engines obtained an injunction to prevent any demonstration within 250 metres of the site entrance. On 27 October, the Birmingham High Court removed the injunction “ab initio”, with the Judge declaring that it “had never existed”, asthe company had failed to disclose the history of peaceful protest at the site. Co-op Bank have closed Cuba Solidarity and Palestine Solidarity accounts without warning. No longer an ethical bank as was taken over by U.S. hedge fund who are now exerting political on a British institution. Unity trust bank which was set up by the TUC is the bank to trust for political accounts. Wolves trades council always used Unity Trust. Labour Party announced they are no longer going to be using G4S  for their conference security. This decision by the Labour Party, which now represents 330,000 members and many more supporters, sends a clear message: our political parties can stand up and act ethically and responsibly, and this can be at the centre of how politics works. Veolia has announced (Aug 2015) that it is completely pulling out of its contracts with Israeli apartheid! This is a huge victory for solidarity with Palestine and the BDS movement and sends a clear message to other companies – doing business with Israel risks your reputation and profit. A victory like this only happens because of the people involved, the dedication of PSC activists and supporters, all of the other campaigners in the UK, in Palestine, and people around the world. Wales drew Israel in the qualifying round of the 2015/16 UEFA Championships. Israel engages in these sporting competitions to appear as a credible European nation, with the aim of diverting attention away from the blatant violations of human rights exacted by the Israeli state on Palestinians. It uses sport to whitewash its racism against the Palestinians, just as South Africa did under apartheid. And just as people in South Africa did, activists are taking a stand. We need to send a message that we will not let Israel's crimes go unnoticed, just as activists protested the participation of South Africa in similar sporting events during apartheid. A major rally in Cardiff is being organised, with people traveling from around the country to protest this match. The Israeli national team will be playing Wales in Cardiff in the qualifying round of the men's Euro 2016 competition on Sunday 6th of September. Why should they not be allowed? There is no fair play in Israel, a country which is illegally occupying Palestine. Wales will be playing against a country which routinely prevents Palestinian people from playing football and competing in tournaments, a team which should be kicked out of UEFA and FIFA. The rules of FIFA and UEFA are clear that there should be freedom of movement for all players around the world and no racism in football. But Israel violates both principles with' impunity. This year Palestine made it through to the 16 finalists in the Asian Cup in Australia despite: player Sameh Maarabeh not being allowed to travel from the West Bank; player Haitham Deeb not being allowed leave Israel; two Palestinian FA officials not being allowed to travel from the West Bank; no Gazan players were able to travel. At the September 2014 Philippines Peace Cup Israel prevented six Palestinian players from Gaza from competing, leaving the Palestinian squad with only three reserves. Palestinian facilities and stadiums have been bombed and players imprisoned. Palestinian national team player Mahmoud Sarsak was held in an Israeli prison for three years without charge until July 2012. An international campaign for his release included Eric Cantona . In 2014 Israeli armed forces invaded the headquarters of the Palestinian Football Association. The Israeli FA did not condemn the raid. Racism is common on the terraces with 'regular chants of "death to Arabs". The Israeli FA does not exercise due control over its clubs and the racism amongst fans deepens. Israel imposes apartheid on all aspects of Palestinian life. Just as in apartheid South Africa Israel should be suspended from international sport until it observes international law and respects the human and national rights of Palestinians. Informing and pressuring our representatives in Parliament is central to our campaign. We need to make sure that our voice is heard in Westminster, and to do that we rely on people like you. This is the first lobby for Palestine that has taken place in this new parliament, so its crucial we send a strong message. Please take action to make Palestine a key issue in this coming parliament, and contact your MP and send one of the following letters to them. Mohammad Rsheid, a farmer of olive and almond trees & Taysir Arbasi, the Palestinian Director of Zaytoun. Last August, amid Israel's bloody onslaught on Gaza, nine members of London Palestine Action occupied and closed the Elbit Systems factory at Shenstone, Staffordshire. Days before they faced trial for aggravated trespass at Newcastle under Lyme. The CPS said it had been forced to discontinue the case after it was informed that two witnesses from the company were no longer prepared to give evidence, and that documentation – understood to be the arms export data – would not be forthcoming. so no demo on 9th Feb outside court! For 2 days nine Roof Top Protesters Closed the Unmanned Aerial Vehicle plant in Shenstone, Staffordshire run by Israeli Arms Manufacturer Elbit Systems. The action of the Shenstone 9 Highlighted the UK Arms Trade with Israel. All the protesters were charged with Aggravated Trespass and could face custodial sentences. Read more: West Midlands Pension Fund - divest from Israeli companies. The Pensions Committee has agreed in its December meeting to maintain its position that the Fund should not disinvest from the named companies. However, as a responsible long term investor, the Fund will engage with the named companies regarding their alleged misdoings where appropriate to express its concerns. Iron wall 2006 documentary by Mohammed Alatr, follows the timeline, size and population of the settlements and their impact on the peace process. They are, the film argues, a deliberate strategy by Israel to make its occupation of the West Bank permanent. The peace process is based on a simple premise – land for peace. Settlements destroy that premise. 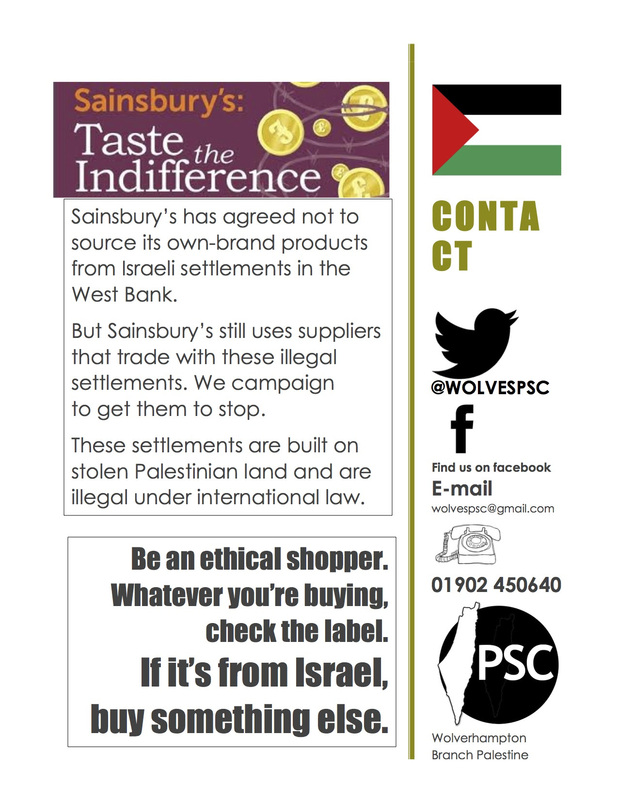 - leafleting of customers outside the new Wolverhampton Sainsbury's St Marks Saturday 1st November 2014 11am until 1pm to explain why they should boycott Israeli products. Wednesday, 20th August Good turnout from all parts of the country in solidarity with the 'Shenstone 9' who stood outside court for 2 hours from 9am before they appeared before magistrates. They were bailed and are due to appear in court again on October 6th. On 26 August a ceasefire between Israel and Hamas was agreed, bringing a fragile end to a war that killed 2150 Palestinians (mostly civilians) and 73 Israelis (mostly soldiers). Since then Hamas has not fired a single rocket, attacked an Israeli target, or done anything to break the terms of the ceasefire. SATURDAY 16th August 12 - 2pm. As part of PSCs weekend of local action around the country we organised a Gaza vigil in Queens Square. A protest (Saturday 2ndAugust) against Wolverhampton City Council’s waste disposal contract with Veolia who are complicit with Israel’s illegal occupation turned into a victory celebration. I can assure you that I and my fellow councillors had no knowledge of this contract. The Art Gallery entered into this contract without our knowledge. It appears that Veolia operate as “Holland Recycling” in the case of the Art Gallery. I believe that the contract is a very small one, for something like trade waste collection. The council will be speaking to other institutions such as schools, bearing in mind that they have the right to let their own contracts separately from the council or the council's position. I am concerned that two schools have similar contracts, although obviously these are not council contracts. Regional march for Gaza Saturday 26th July 2014 marched Farm park, Sparkbrook, to the Birmingham Mailbox for a rally outside the BBC offices to deliver a letter of complaint to the BBC. The protest was supported by community organisations in Birmingham and by pro Palestinian supporters in areas surrounding Birmingham, including Walsall and Wolverhampton. Saturday 19th July 100,000 strong national demo London transport from Wolverhampton. Called by Palestine Solidarity Campaign, Friends of El Aqsa, Stop the War Coalition, British Muslim Initiative, Campaign for Nuclear Disarmament & Palestinian Forum in Britain. March to Israeli embassyfrom Downing Street. FRIDAY 27th June 2014AFTER KERRY: WHAT NEXT FOR PEACE AND JUSTICE IN PALESTINE? Public Meeting. The meeting will reflect on the end of the Kerry-led failed peace talks in the light of the US Secretary of State concluding remarks 'Israel could become an Apartheid state'. Kamel Hawwash is a leading Palestinian in the West Midlands will report on what is happening inside the occupied territories and examining how the solidarity movement should respond. Rob Marris campaigned relentlessly for Palestine when he was last an MP and will be exploring Labour Party policy in the Middle East if the Palestine Solidarity Movement can influence a future Labour government. Friday 10th January 2014 public meeting on West Bank visit and migrant workers.